Because I always have a BROTHER...I always have FRIEND. Your brother is always the first male friend you will have in your life. Nobody will ever be able to understand your craziness like your brother and although you don't see each other as much as you'd like, he will always remain your friend and be there for you when you need him the most. While people will come and go in your life, your brother will be in your heart for a lifetime. We are so close, that you're my twin, We've been together, through thick and thin. I Love you Best Friend! You aren't just my Best Friend. You are my sister and I love you to freaking death. I don't know what I would do without you. Your brother is your first male friend in your life. No one will ever understand your craziness like your brother. Even if you don't get together or talk as much you'd like, he always remains your friend. 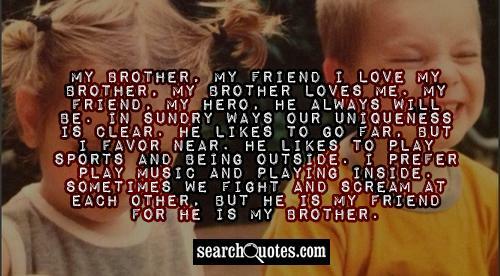 While people come and go in your life, your brother will always by in your heart for a lifetime. Our path may change as life goes along, but the bond between us remains ever strong. I miss you SISTER. My Brother, My Friend I love my brother, my brother loves me. My friend, my hero, he always will be. In sundry ways our uniqueness is clear. He likes to go far, but I favor near. He likes to play sports and being outside. I prefer play music and playing inside. Sometimes we fight and scream at each other, but he is my friend for he is my brother. I don't believe an accident of birth makes people sisters or brothers. It makes them siblings, gives them mutuality of parentage. Sisterhood and brotherhood is a condition people have to work at. A brother sister bond is a very special bond, mainly because they grow up together and know each other in and out. Being of opposite gender, a brother gets to know more about a girl’s psyche by having a sister. Likewise, it is for the sister too. She can come to know about men and their nature. 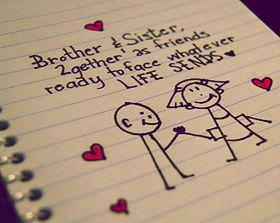 A brother sister pair can mutually help each other to stay strong and provide immense emotional support to each other too. The elder person in the pair, whether the brother or the sister, can always stand as a pillar of support to the younger sibling and make his/her life easy. Brother Sister Bond involves friendship and understanding of the closest levels and that is exactly makes this bond unique.